Re-entry trading is a high probability trading concept in my course – “Day Trading with Price Action“. It is a simple but powerful concept that works in all markets. In this article, I will explain it with price action patterns in the forex futures markets. Does the following experience sound familiar? After carefully studying the market bias, you took a long Pin Bar trade in the EUR/USD forex market. Accordingly, you placed a pattern stop just below the Pin Bar. Shortly after, the market fell and hit your stop-loss order. Almost immediately after you got stopped out, the market leapt up again. If you were nimble and alert, you might have re-entered the position. If not, you might have been left standing in the dust while the market blazed ahead without you. In any case, you would be frustrated and have suffered a loss due to the first original Pin Bar entry. Thus, in the re-entry trading strategy, we aim to skip the first entry and enter the market only upon the “re-entry” opportunity. A re-entry opportunity often offers a higher probability of success. Essentially, while our trading premise is the same, we delay our trade entry. Do not take the original setup. Wait for the traders of the original setup to be stopped out. Enter as the market reverses and moves in the direction of the original setup. As the traders of the original setup were stopped out, they would need to seek a re-entry. In other words, they were trapped out of their positions and had to re-enter. Their re-entries would help to push the market in our favour. 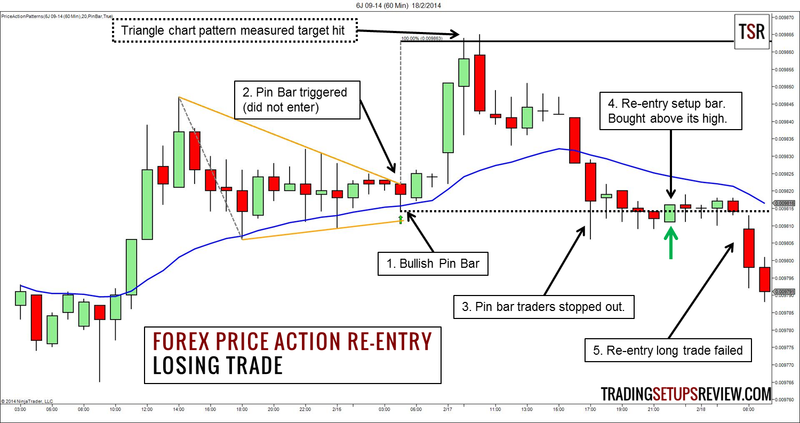 In this set of trading rules, we will use the Pin Bar, a popular forex price action pattern, as our basis for re-entries. You can replace it with any other price action pattern. This is a 30-minute chart of the 6E forex futures (EUR/USD). A bullish Pin Bar bouncing off the EMA. It was a decent setup, but in our re-entry trading strategy, we do not take it. As the market rose above the Pin Bar, some traders initiated their long positions. Two bars later, price fell and hit stop-loss orders placed around the low of the Pin Bar (a common pattern stop level). The market recovered quickly and offered a re-entry chance with a second bullish Pin Bar. We bought as price broke above its high. After our entry, the market rose with a strong thrust. This is an hourly chart of the 6J forex futures (JPY/USD). 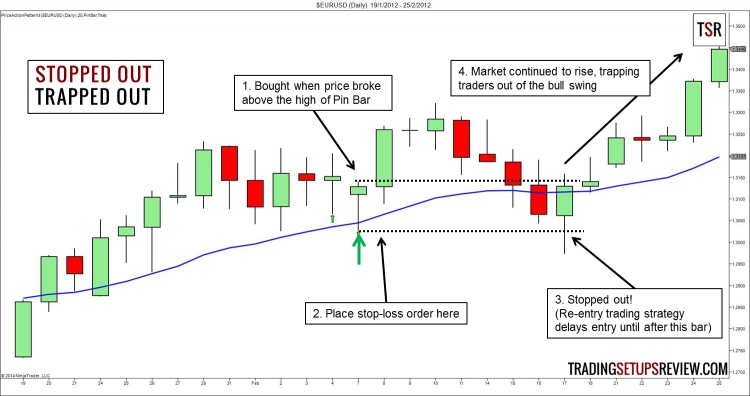 A bullish Pin Bar bouncing off the EMA after finding clear support around it. After overshooting the last trend high, price fell and hit stop-loss orders placed at the low of the Pin Bar. As buying pressure emerged (lower shadows), we bought as the market rose above a bullish Marubozu. The market meandered for a few hours before falling again, resulting in a loss. This losing trade has a stark difference with the winning instance. The losing instance’s re-entry occurred below the moving average. It was a hint that the market bias was no longer bullish. On the other hand, the winning example’s re-entry setup bar had the support of the moving average. Moreover, the market has hit a target projected from a triangle chart pattern (orange lines). Since the original setup took place with the break-out of the triangle, the projected target held sway. After the projected target was hit, some traders took their profits and closed their long positions. It follows that when the market fell down, fewer traders were stopped out and trapped out. Hence, the re-entry approach was not ideal in this case. 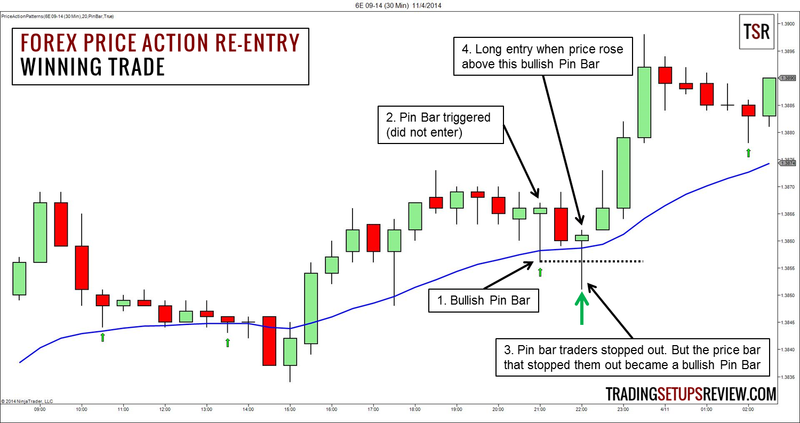 The re-entry trading strategy is a simple method to enhance the probability of any price action pattern. Generally, good re-entries occur soon after the original setup. The re-entry trading strategy is versatile as you can use any price pattern as its basis. Thus, it is easy to look for re-entry trading setups using the price action patterns you are already familiar with. All it takes is patience. Skip the original entry and wait for the re-entry. Like many other trading methods, it is not mechanical. It is a discretionary approach to trading that focuses on prudence and patience. Always consider the market bias before using the re-entry trading strategy. It is not meant for use in isolation. Using a re-entry trading strategy in forex trading has its trade-offs. The main drawback is fewer trading opportunities. At times, the market takes off without offering a re-entry opportunity. In such cases, we miss out on the profits. This is a necessary sacrifice for better forex trading odds. If you tend to overtrade, I strongly recommend that you adopt this re-entry trading approach. It offers a trading technique that lowers trade frequency and increases probability of success. Experiment with this concept in markets beyond forex. 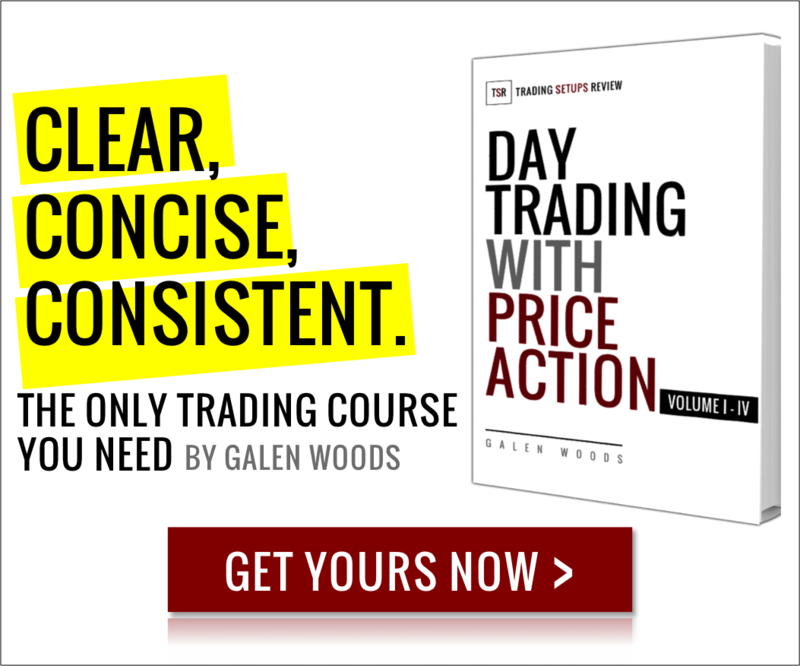 To learn how to find the best re-entries, check out “Day Trading with Price Action”.